First of all, I feel that the book should have warned you that tissues will be needed mainly because this novel begins and finishes a couple of months after the tragic way the Doctor and Donna parted company, and if you were like me and still find her departure one of the saddest that the show ever produced then you will find yourself welling up in the end. The non-linear way this story is told to us is what instantly appealed to me, the book beginning and ending a few months after Journey's End with the bits in the middle taking place sometime after Silence in the Library/Forest of the Dead. 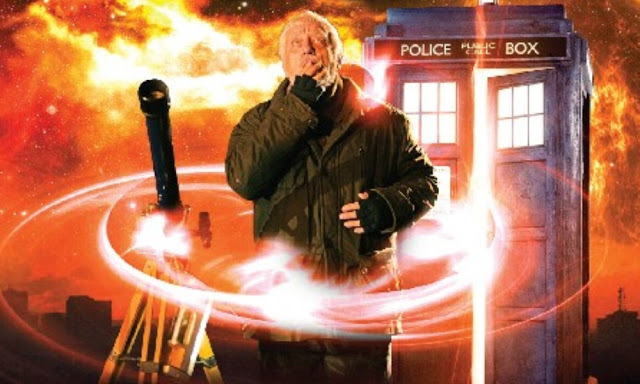 While for Donna's mum, Sylvia and her grandfather, Wilf, the story takes place not long after The Sontaran Stratagem/The Poison Sky. The main bulk of the story takes place over a four-day period, Friday-Sunday and then jumps forward a week for the last little bit. Usually, author Gary Russell can get bogged down in this strange way of telling a story but here, he doesn't allow himself to do so. But it is the bits post-Journey's End which are the most heart-breaking moments in the whole thing. During the beginning of the novel, Donna is in a very reflective mood, given that she has just gone through what happened with CAL in The Forest of the Dead and she returns home on the one-year anniversary of her father's death. Of course, her mother is sarcastic and can be plain nasty but Russell manages to handle the character of Sylvia a lot better than the television series ever managed to do. Here she is better realised and three-dimensional than her television counterpart and I found myself sympathising with her a lot more than I ever did with her on television. The Doctor and Donna get some nice banter which feels a lot like that which we had on screen and Gary Russell captures the pair of them perfectly. Donna's descriptions of the Doctor as, 'skinny', 'Martian-boy' and 'spaceman' never feels forced and you will find yourself smiling at pieces of the book. What I also liked was the further confirmation that Donna and Martha really did get on as she considers going to UNIT and Martha for help in rescuing the Doctor. And Donna's realisation that she isn't going to find UNIT under the Yellow-Pages, is hilarious. Given that this book was released in 2008, I'm not to worried about telling you the villain is the Mandragora Helix. The Mandragora Helix first appeared in the 1976 story, The Masque of Mandragora and appeared sporadically throughout various other pieces of Who related fiction, but most notably in the First Doctor novel, The Eleventh Tiger and I think that Gary Russell mentions the events that happen in both of these Mandragora related stories. Once the battle is finally over, the Doctor and Donna have a quiet moment in which they spend time discussing Mandragora's use of other people. The Doctor says that mankind are just tools to the Helix. Tools that can be used and then abandoned. Donna then mentions Netty, a older woman who appears to be the love interest for Donna's granddad, Wilf. But she has Alzheimer's. The Doctor, a little cruelly uses Netty as a way to defeat the Helix by making it also get Alzheimer's. The Doctor then tells Donna that was once a time when he would have done worse to Netty to win and save the world but Donna brushes it off, saying she has made him a much better person. It is a sweet little moment which proves how much Donna has rubbed off on the Doctor and then gives the ending of the book, set after Journey's End, a much greater impact.